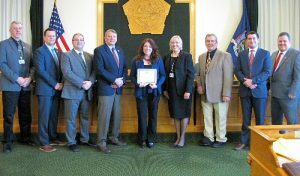 OSWEGO – The Oswego County Legislature’s Human Services Committee presented Mary Rebeor with a certificate of appreciation for her 25 years of service. Rebeor is a senior typist with the Oswego County Human Resources Department. Pictured from left are Committee Vice Chairman Bradley Trudell, District 7; Tim Stahl, District 20; Nathan Emmons, District 15; Committee Chairman Roy E. Reehil, District 5; Rebeor; Carol Alnutt, director of the Oswego County Human Resources Department; James Karasek, District 22; Thomas Drumm, District 16; and Daniel T. Farfaglia, District 24.